Our cups are made from an extremely high grade paper which provides both rigidity and sturdiness. We ensured that no details (and costs!) were spared when developing these amazing coffee cups. Feel the thick and sturdy paper cups in your hand, and the weight of the cups and the lids. You'll know why these have been so well received by our customers! SPECIAL TIGHT FITTING LIDS = NO LEAKS EVER! Our lids are specially made to be sturdier, and fit very snugly over the cup to ensure absolutely no leaks! In addition, we designed our lids to be enclosable (or reseal able), it snaps snugly into the mouthpiece and it will 100% lock in your beverage. You can feel comfortable taking this around in your car, or when you're on your morning commute, without fear of any spills / leaks! Our wonderful customers have bought these for weddings, parties and even use in offices! These cups are designed to make you stand out, but yet versatile enough to use it for any occasion you can think of! 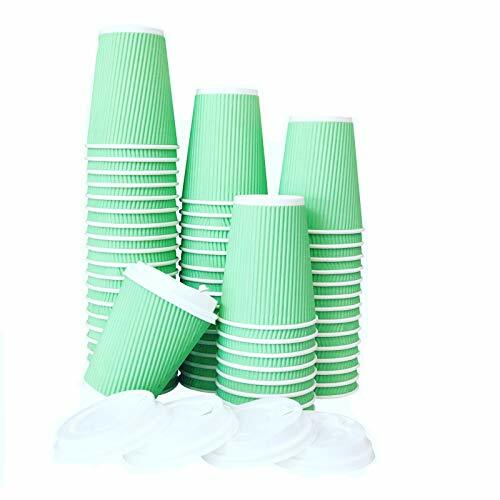 ECO FRIENDLY & 100% RECYCLE : Made with top quality food grade paper material.The included lids snap into a perfect fit with each cup.FarSmart Paper Cups are friendly to the environment compared to regular plastic cups. We stand by incredibly high quality of our product. 100% MONEY BACK GUARANTEE: This is totally risk free buy, if you are not satisfied with our coffee cups, your satisfaction is our top priority. So you can ask for money back,NO Question asked.If you think our product is not what you are looking for,write our customer service and we will refund your money immediately. LEAK FREE GUARANTEE : Our specially designed lids are sturdy and create a tight and firm seal with your cups to stay 100% on, ALWAYS. In addition, we also took the extra step to create an extra seal for your lids to ensure that your drinks will stay in during your commute. Sip from these with confidence! RIPPLE PROTECTED: There's NO NEED for flimsy coffee sleeves. Our ripple protected cups offer maximum protection from hot beverages. Our coffee cups have a ripple layer on the outside to protect your fingers from being burned. Don't worry about scalding hot coffee cups when using Tasty Essentials Ripple Cups! SAVE YOUR MONEY: Our premium disposable paper cups come complete with lids! Save yourself the extra money and the hassle of searching for the correct lids! Plus with our smart heat insulated design,no ned to look for heat sleeves as well! Simply put, one COMPLETE package of 12 Oz cups. If you have any questions about this product by FarSmart, contact us by completing and submitting the form below. If you are looking for a specif part number, please include it with your message.